2. What can biogas do for me? 3. Which certificates does Novatech possess in the biogas sector? 4. Which motivation is the driving force for the biogas team? 5. How safe are biogas plants? 6. How much experience does Novatech possess in building biogas plants? 7. Does Novatech also guarantee specific kW outputs? (process support / technical support)? 9. Why is it essential to have a tailored biogas plant? 10. What is a local heating network and what is its purpose? 12. What are difficult substrates? 13. Which main components are required for operating a biogas plant? The production of biogas is not a technical achievement, but rather a natural process that has been around for millions of years. The existing biomass is converted into its source materials under the exclusion of oxygen and is thus again available for new biomass to be created. In scientific terms this means: Biogas is the result of the anaerobic fermentation of biomass. The gas blend thus created – dependent on the substrate used - features a methane share (CH4) of about 50 - 70 percent and a carbon dioxide share (CO2) of approx. 30 - 50 percent. A low concentration of hydrogen (H2), hydrogen sulfide (H2S), ammonia (NH3) and other trace gases may furthermore be found in the blend. What can biogas do for me? Which certificates does Novatech possess in the biogas sector? Novatech is certified as a specialist company in accordance with WHG §19 (Water Ecology Act). This act includes regulations for the protection of water and soil including numerous ordinances and technical regulations. Only craft enterprises in the possession of the quality seal are authorized to install, erect, maintain, repair, and clean plants that are sensitive regarding the environment. Which motivation is the driving force for the biogas team? How safe are biogas plants? The fact must be mentioned that there is no such thing as absolute safety for biogas plants. Proper qualification of the operator as well as of the plant manufacturer is thus essential. Novatech may look back on 20 years of experience in the construction and building of biogas plants. Since 1996, Novatech has furthermore gathered experience by operating a company-owned biogas plant on site at the corporate premises. How much experience does Novatech possess in building biogas plants? Until 2011, Novatech has been involved in the construction and planning about more than 150 biogas plants with a total output power of 25,000 kW. Under the assumption of 8,000 operating hours per annum (max. possible: 8,760 hours), these plants consequently produce 200 million kWh of electrical energy per annum. In mathematical terms, more than 50,000 households of four are thus supplied electricity in an environmentally compatible way. Assuming an average production of 670 g/kWh CO2, more than 100,000 tons of the greenhouse gas CO2 are thus “saved” every single year. 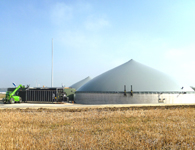 In 2011 Novatech has put into operation over 40 biogas plants nationwide and one plant in France. Does Novatech also guarantee specific kW outputs? A performance guarantee may be provided in combination with our low-priced intensive process support program “all-round carefree package”. The exact terms depend on the respective project and will be clarified during the preparation of the project. What will happen after the biogas plant’s completion? Why is it essential to have a tailored biogas plant? Our experience shows that the biogas plant technology used should be defined in accordance with the substrates list and the plant location. We strongly advise against the construction of a predefined and inflexible plant system. This is primarily true for periods during which the substrate prices increase and the search for economic alternatives is intensified. The selection of the proper technology reduces internal energy consumption and maximizes the plant operating time. This is the only way to ensure an economic operation of the plant also in difficult times. Why are the compact liquid manure operated plants offered as standardized plants? The differences between compact liquid manure operated plants are very small, to where the three different options offered (50, 60 and 100 kWel) are the equivalent of a “tailored” system, which may furthermore be offered at a lower price. What is a local heating network and what is its purpose? When operating a combined heating and power plant, heat will be generated in the cooling water and exhaust gas. Utilization of the waste heat increases the overall degree of energetic utilization of the biogas plant. Part of the heat generated is used within the process in order to heat the fermentation tanks, The largest part, however, may be supplied to external consumers. 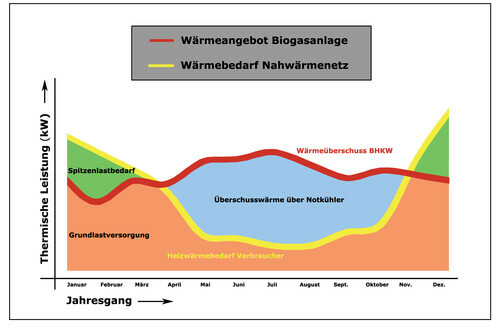 The heat generated in the biogas plant is then conveyed to the consumer via the local heating network. The revenue generated by selling the heat together with the CHP bonus enhance the profitability of the entire biogas plant. Which main components are required for operating a biogas plant? Here, the liquid feedstock (liquid manure, surface water and seepage) is collected and then fed into the fermentation tanks. The solids feed is used to supply solid feedstock to the fermentation tank. Select the input volume of the solids feed so that a sufficient amount of feedstock for a single day’s ration may be input. Biogas generation occurs under anaerobic conditions in the sealed reactor. Here organic materials will be disintegrated and converted into biogas by various kinds of bacteria. Stirring systems are used to homogenize the feedstock and mix it with the already active fermentation substrate in the reactor. In order for the anaerobic bacteria to work optimally, heating the reactor is required. The previously fermented substrate will be stored in the sealed post-fermentation store prior to its distribution on the fields. In case of high reactor loads and short dwell times, a considerable amount of biogas may also be generated in the post-fermentation store. The biogas generated in the reactor and post-fermentation store must be collected and intermediately stored in order to ensure a high plant utilization rate. Biogas is fed from the gas accumulator to the combined heating and power plant for the generation of heat and electricity. The electrical energy is fed into the local mains and a compensation fee is paid in accordance with the local EEG rates. In order to increase the overall efficiency and profitability of the biogas plant, the excessive heat that is not required for heating the fermentation tanks may be sold for external heating purposes. The gas pipework is used to transport the gas from the sealed fermentation tanks to the gas accumulator and further on to the point of utilization. The general term substrate pipework usually refers to the feed line from the pre-pit to the fermentation tanks, the overflow between the individual fermentation tanks and the substrate lines for recirculation. The term “photovoltaics” refers to the direct conversion of solar energy into electrical energy by means of solar cells. The name is made up of the constituents “photos” – the Greek term for light – and “volta” – named after Alessandro Volta, the founding father of the electrical age. 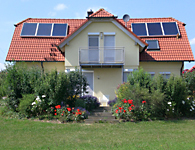 Photovoltaics are a branch of solar technology, which e.g. also includes the utilization of solar thermal energy. When solar radiation hits solar cells a direct voltage is built up between the upper- and underside of the cells. It is picked off via conductive tracks and then converted into alternating current in a so-called inverter (= consumer). In our part of the world, a photovoltaic plant with an output power of 1 Kilowatt peak (1 kWp) generates round about 900 to 1,050 kWh of electricity per annum. So far, Novatech GmbH has installed round about 2.300 photovoltaic plants with a total output power of more than 65 MWp. With a mean feed power of 1.000 kWh per annum, these plants generate over 65 million kWh of electrical energy every year. With this, a calculated number of 16,500 households of four may be supplied with electricity in an environmentally compatible way and approx. 46.000 tons of the greenhouse gas CO2 may be “saved” per annum. Different types of photovoltaic cells exist: hybrid cells, mono-crystalline, poly-crystalline and amorphous cells. They primarily differ in their energy yield per surface area (efficiency) and in the efforts required for their production. Mono-crystalline hybrid wafer with amorphous silicon are the most complex when it comes to production. They are a combination of amorphous and mono-crystalline technology. The modules reach the highest modular efficiencies. Consist of purest semiconductor material. A silicon melt is used to draw mono-crystalline rods, which are then cut into thin slices. This specific manufacturing process ensures relatively high efficiencies. Liquid silicon is cast into blocks, which are then cut into slices. Whenever the material solidifies, crystalline structures of varying size are formed, at the boundaries of which defects occur. This crystal defects result in a lower efficiency of the solar cell. A layer deposited on glass or on other substrate material, e.g. consisting of silicon or copper diselenium. The thickness of the layers is less than 1 µm, to where the cost of production is lower, simply on account of the lower cost of materials. The efficiencies of amorphous cells, however, are distinctly lower than those of the other two cell types. Thin-film modules are capable of handling diffuse light quite well. This is the reason why they are used on roofs facing east and west. In order to realize maximum yield, photovoltaic plants (on the northern hemisphere) should possibly face southward.The azimuth angle describes the deviation of the PV surface from the south regarding east-west orientation.The azimuth angle will be 0° whenever the surface precisely faces southward; will be positive for westward orientations and negative for eastward orientations.Perfect westward orientation will consequently result in an angle of +90°, precise eastward orientation -90°. A photovoltaic plant in general will not increase the risk of a building being struck by lightning.Despite this, the installer or planner of the photovoltaic plan is nevertheless obliged to install it in compliance with the valid standards for lightning protection. This on the one hand protects the photovoltaic plant from damages. On the other the remaining building installations will be protected against excess voltages, which could possibly be coupled in via the photovoltaic plant. No carbon dioxide (CO2) is released during the operation of a photovoltaic plant. During its service life, a photovoltaic plant will furthermore generate distinctly more energy than was required for its production. Due to this, photovoltaic plants make a contribution to the reduction of CO2 emissions. Per Kilowatt peak installed PV power, a minimum of 7 t of CO2 are thus avoided. The term “roof inclination” refers to the angle of a roof towards the horizontal plane. The yield of a photovoltaic plant depends on the installation of the photovoltaic surface. For roof inclinations between 20° - 50°, the solar modules are usually installed in parallel with the surface of the roof. The design advantage and a visually harmonious integration of the plant into the overall appearance of the building are a priority here. In case of flat roofs or roofs with only minor inclination, the solar modules will not be installed in parallel with the surface of the roof, but in Germany rather erected at an angle of about 25° - 35°. If the inclination of the solar modules is lower than 20°, they will not be sufficiently cleared from snow and rain. Individual development schemes exist in accordance with the EEG, such as e.g. low-interest loans from KfW. Since these are subject to frequent changes, we recommend finding out about the latest state under www.kfw.de. kWh = unit for energy / work, corresponds to the output power of one Kilowatt over a period of one hour. The electrical energy yield of a photovoltaic plant is frequently stated in kWh. kWp = unit for the maximum power output of a solar module or of a solar generator. The usual index “p” of the unit of power makes reference to the fact that the output power of the solar module or generator was determined under standard test conditions (STC). Since standard test conditions will only rarely be reached in practice on account of the higher operating temperatures of the photovoltaic modules, the output power of a solar module or generator during operation will usually remain lower than its peak power. A tracked plant revolves the solar generator in the course of the day to thus follow the position of the sun or maximum brightness. In case of a two-axis tracking system, the solar modules will always be in an optimal position towards the sun. The yield of a photovoltaic plant in Germany may thus be increased by about 30% in comparison with the fixed installation of a solar plant. Tracking may be in the form of single-axis or dual-axis tracking. Tracked plants are particularly suitable for open-air installations. A photovoltaic plant will generate electricity whenever light hits a solar generator. A danger for the service staff of the mains operator could occur if a solar plant connected to the mains would continue feeding electricity into the mains during repairs. This is the reason why the plant will automatically be disconnected from the mains as soon as the latter is switched off or fails to operate. A mains monitoring facility in the inverter thus constantly verifies if the mains network operates properly. 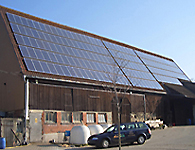 A solar plant in Germany should – if possible – face south and be inclined by about 30°. But even if additional deviations of up to 30% occur either to the south-east or south-west, the yield of the plant will only drop by about 5 – 10%. STC = establish the general setting in which the output power of a solar module is measured and specified in the laboratory. Constant variables of the measurement are: radiation intensity of 1,000 W/m², spectrum of light after passage through the 1.5-fold thickness of the atmosphere (AM 1.5), temperature of the solar cell 25 °C. Partial shading of the solar generator has a distinct effect on the yield. Due to this, the solar modules should not be affected by any shading if possible. The photovoltaic plant should definitely be incorporated into the existing insurance contract for the building or a specific solar insurance should be concluded. Some insurance companies offer a yield failure insurance for downtimes of the plant as additional insurance. Here the terms should be closely studied. We recommend in any case having the photovoltaic system incorporated into the liability insurance of the building.